← Second false Affidavit – Shocking ! Is it okay for your neighbour, somebody down the road, an ex-partner to stalk you and harass you? No, it is not okay. If fact, if this happened you would probably go to the Police and take out a restraining order on that person (beware this could be struck out by an interlocutory application, and you too, may have to pay the assailant’s legal costs). What then, when lawyers are the ones who are doing the harassing ? Sending you things in the mail, they continue to try and contact you by email when you have let them know you don’t want them to contact you by email (after having two false affidavits of service delivered by email)? It is pretty much a natural law “you abuse it, you lose it”. This occurs naturally throughout life. If you drink and drive and get caught – you lose your license. If you stab someone, you lose your freedom. If you continue to abuse someone either physically or emotionally – they will eventually leave you – you lose that person. People do not have to put up with abuse, it is not okay – we are told this on TV! Why would anyone want to continue with any form of relationship that is abusive? Nobody does, although some unfortunately, are trapped into it. The law protects us from these people, or does it? Actually, no it doesn’t, I have learned that the LAW favours the harassers! I have been nothing but harassed by the lawyers for the applicants (AND THE MENTAL APPLICANTS). In fact, the applicants in this matter have sworn (not that that means anything to them) in their documents to stalking me. I sent the lawyers for the applicants an email that read “please note you have been blocked from my email.” I also had my mail directed to another address, because I couldn’t bare the ONSLAUGHT of harassment through the post. Because you see, as far as I am concerned, what they were doing to me was complete and utter “harassment” (they tormented me with TWO FALSE AFFIDAVITS OF SERVICE, amongst many other affidavits containing nothing but lies!). 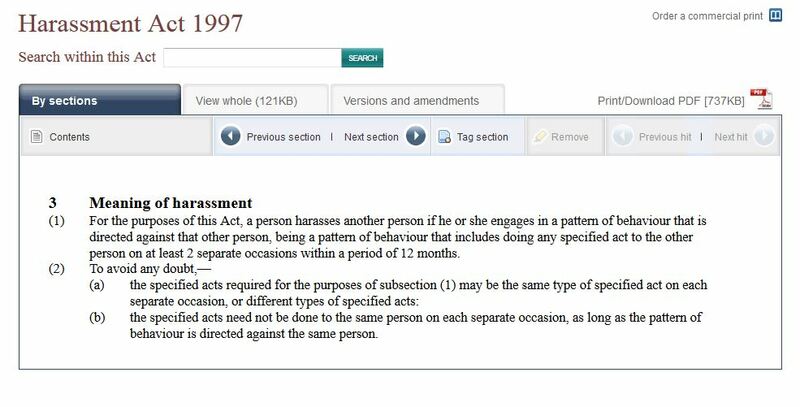 It may not have been illegal harassment because it was used by a lawyer (therefore, it is a legal form harassment). Proof – lawyers are above the law. What the LAW considers “harassment” and what a reasonable person considers “harassment”, are two different things (THE district Court Judge had his eyes wide shut!). I do not want to be harassed by email AND I DO NOT want to be harassed by mail either! My blog obviously offended the lawyers, so they attached it with a memorandum to Court (filed late again) to show the Judge! Sorry Judge and counsel for the applicants, if I offended you. I was rather offended that someone swore an affidavit (in fact two different affidavits with different times and different dates) to serving me with an application for order placing my child under guardianship of the Court – when he didn’t. I suppose that doesn’t really matter to you, as long as the end result is a “win” and you are getting paid. And yes, I was deeply distressed by the “false affidavit” (when I realised that nobody gave a toss about it and that the proceedings had commenced on crime being committed WITHIN COURT) I was served with – just – not the many errors in the affidavit, which is what you apologised for. Lawyers are not above using snail mail if they abuse their privilege! Are they? I am not aware of any law that requires me to unblock them from my email. Perhaps they will find a loop hole on this. The lawyers for the applicants even went so far as to put messages for me, on the tail end of correspondence directed to the Court, by email ! And one more thing – never forget that there is no such thing as rights. The applicants don’t have any rights over my child – yet look at what they have done to my family within the system. And my parental rights – zippo folks. Short and Sweet! Just or Unjust? Hauraki Gulf Law continually utilise FALSE AFFIDAVITS to harass me. This is not JUST, they mislead the Court (there is no denying it) and they commit crimes within the Court itself. Dirty Lawyers – definitely not a dime a dozen! In my case I was COURT ORDERED TO PAY $4,606 to the mungrel lawyers so they and their clients could have the RIGHT TO continue to HARASS AND COMMIT CRIME AGAINST ME! Justice – yeah right. I am far beyond ever believing that will happen in the CIVIL/FAMILY COURT! They should change the name to CRIMINAL COURT because that is exactly what it is. Applicants paying their LAWYERS AND THEIR CRIMINAL HIRED HELP TO COMMIT CRIMES IN COURT! Jolly Good! No problem, move along. Did John Robertson of Hauraki Gulf Law harass me on two or more occasions? Absolutely, there were two FALSE AFFIDAVITS of “Service”, before we even begin with the rest of the harassment that I have endured! In fact, there is now a syndrome for the abuse I suffered. “LEGAL ABUSE SYNDROME:” See below. Vivienne Holm wants a practicing certificate – Really? How do we stop this violence?